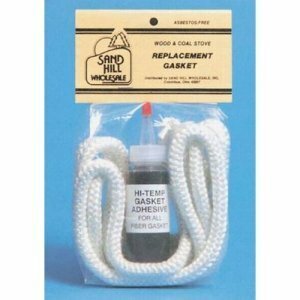 Stove gasket kit comes with 7' of 3/8" rope fiberglass Door gasket and High-temperature Cement (adhesive). This size gasket is used on some Appalachian, Ashley, Carolina, Country Comfort, Craft Stoves, Fisher, Suburban, U S Stove Products, Woodchief and many more. Note: If unsure of the correct size, please measure the width of the door channel or consult manual.